Well today´s card was a struggle. I had to make it twice, me and so much black ink is not a good combo. I had blad ink all over and also glossy accent in the wrong place. But made it again and this time I was suuuuper careful. Found this video on YouTube by Jen at Worldofjencraft. You Can find her video here. 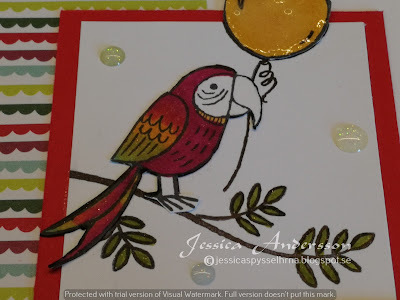 I used thick whisper white cardstock as base for my card. Then added som designer series paper (DSP) from the tutti-frutti pack. 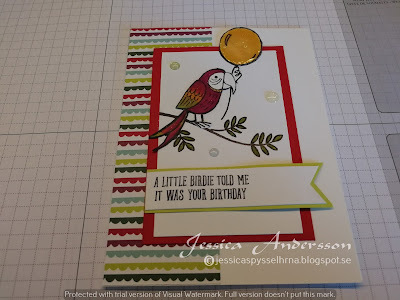 On another piece of white cardstock I stamped the branch and the balloon from the stamp set called bird banter. Then stamped the bird and the balloon on some extra piece of paper then coloured them in with my copic markers in matching colours to the DSP , I coloured the leaves with Stampin´up markers, using then colour old olive. Added som wink of Stella on the bird, leaves and the balloon. Also added some glossy accent on the balloon. The sentiment is from the same stamp set and is layered on a piece of lemon lime twist cardstock. Both of them are punch as a flag with the triple banner punch. To finish my card I added some glitter enamel dots and a little bakers twine-bow.